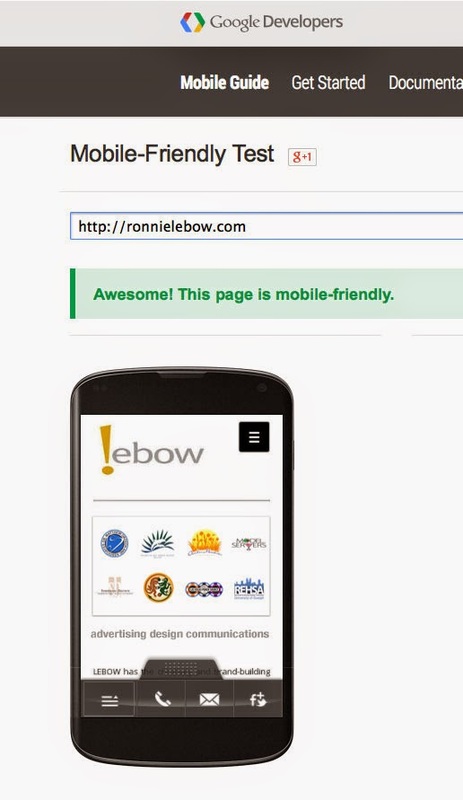 Ronnie LEBOW: The year of the mobile-friendly site. The year of the mobile-friendly site. This week, Google tilted the search engine algorithm in favour of mobile optimized sites. In layman’s terms, if your site is not mobile friendly, it will be moved down the search engine ranks giving your competition an advantage. Every business in 2015 MUST have an online presence and now, according to Google, they should also be mobile friendly. And chances are your current website isn’t. To find out if your website is mobile friendly, click this sentence. If your website has passed, GREAT. You are up to date. If it didn’t, and you are currently working with a web designer, make sure to ask them to optimize your website so it also works on mobile devices. If you are NOT currently working with a web designer and need a newly designed site, or want your current site updated and/or transformed, I have a special on complete packages at this moment that will be extremely gentle on your budget.